Sydney's drinking water comes from so many different sources, yet the quality and purity is reliably high. In fact, many authorities including Sydney Water regularly publish their test results. However, many Sydneysiders enjoy the taste of bottled water and the feeling of knowing that tiny traces of minerals aren't building up in their system. Purer water doesn't just taste noticeably different, it can also improve a range of health related symptoms including skin sensitivity. Test the difference for yourself - select a bottle of filtered (not spring) water from the supermarket, bring it home, have a taste and then compare it to a small taste of tap water. If you're interested in having clearer and purer water, there is an easy (and budget friendly) way. 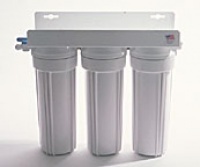 Just explore the range of systems available online here at Water Filter World! We've got one of the country's biggest ranges, all available for shipping to your door. Whether you're looking for a special fitment for your fridge (there's nothing quite like purified and chilled water on tap on a hot summer day!) or a whole house system so you can control everything from your drinking and cooking water through to your showers, we've got you covered. With several years’ experience in filtration technologies, we can easily match your current and future water needs with a suitable system. Start browsing via the menu to the left. If you have questions or would like assistance with ordering your water filters, please call 1800 217 726. Alternatively, you can contact us online and we'll get back to you as soon as possible. For new clients we recommend purchasing a Reverse Osmosis filter and Alkaliser and we offer a super special package that includes the quick-change reverse osmosis filter with a PI alkaliser and includes free Delivery Australia Wide!